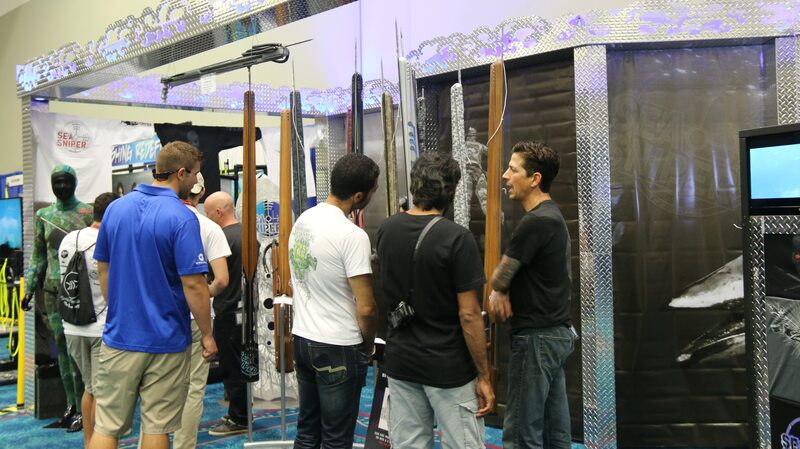 People streamed through the doors during Day One of the Blue Wild Ocean Adventure Expo in Fort Lauderdale, Florida. Show organizer and champion spearfisherwoman Sheri Daye tells DeeperBlue.com that judging by the number of people that have already bought entry passes, the weekend event could surpass 3,000 attendees before the doors close on Sunday. Daye’s original Impetus for the show years ago was a desire to do a fundraiser for her brother’s school, a center for the developmentally disabled. As president at the time — which she still is — the school was in financial trouble. “It was going in the red,” she said. “It was kind of a precarious situation where the might close the doors, so I was trying to think of ways to raise money. We’d had our national spearfishing tournament here, and I had a couple close friends I knew people would enjoy listening to, so I asked them if they would speak. And boy has the event grown. People young and old walk down the aisles of the exhibitor hall, checking out the wares of major scuba, freediving and spearfishing players like Beuchat, Mares, Daryl Wong spearguns, PADI, Immersion Freediving, and Divers Direct, among others.